He’s been the exec chef at the Hilton Adelaide, co-directed the longest-running national food festival in the country, Tasting Australia (since 2014), and started his own quality ingredient range, dirt(y). But you probably know him from The Cook and the Chef, a popular ABC television series he co-hosted with Maggie Beer for five years. He is Simon Bryant. 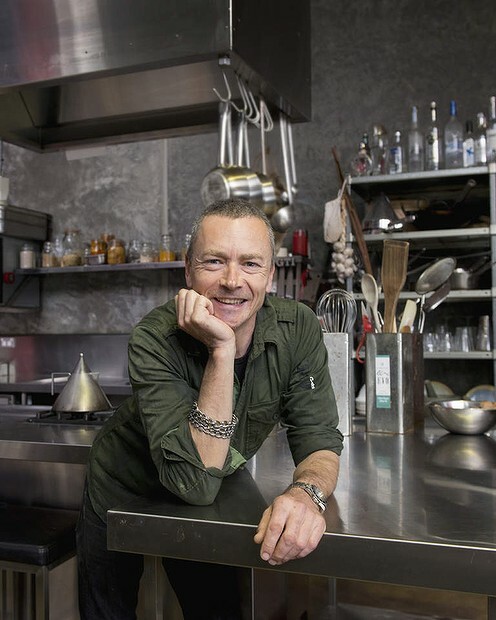 Originally from England, then Melbourne, the award-winning (veg-loving) chef moved to Adelaide in 1999 and now calls that city’s inner suburb of Brompton home, where he lives happily with his Doberman pup, Sidney. His latest book, Vegetables, Grains & Other Good Stuff is out tomorrow. My pantry: It’s my own product, but I always have some dirt(y) sunset red masoor dhal handy and I keep a bulk supply of Hardings extra virgin olive oil (for cooking) and some Joseph First Run EVOO​ for finishing dishes. Other must-haves include Megachef light soy sauce (naturally processed and gluten-free) and Slater Farms’ Rainfed​ biodynamic brown rice (low GI, good for the environment and I love the nutty smell when you’re cooking it). My fridge: I buy fresh veg daily but I always keep some home-made mushroom paste (great for stocks, on fresh ciabatta or bruschetta). And, as the base for a lot of stir-fry and noodle dishes, I always have home-made red and green fermented chilli sambal. I allow my chillies to ferment for a bit before adding vinegar, so I get all these complex, amazing flavours. I rarely eat dessert and just don’t have a palate for junk food. The worst I can think of is butter. I’ll cut a half-centimetre slab for toast in the morning. I don’t spread it. Lime rice pilaf and red lentil dhal, spiced simply with cumin, chilli, fenugreek, mustard seed, fresh turmeric, garlic and ginger. I never tire of it. The trick is to take the hard spices “to the edge” in a hot pan, making sure the oil is properly infused with flavour. I drink tons of water and the very occasional lager (I like Vale lager, a local brew, and Coopers 62 Pilsner, which goes so well with Asian food). I have a ridiculous collection of amazing vodkas and gins, including Kangaroo Island Spirits Wild Gin, Kauffman vodka, Beluga vodka and even quinoa vodkas. On the (rare) occasion they are consumed I’ll have a gin and tonic, a vodka martini or vodka straight (no ice, no god-awful mixers and definitely at room temperature). KIS Old Tom Aged Gin is a favourite. I love the romance of these so-called “bathtub-style” gins. I’m not a gadget guy. I don’t care much for sous vide, thermoblahs and all the whiz-bang appliances that promise everything and quite often break. But if I ever lost my old Sabatier carbon steel cook’s knife I’d probably just quit cooking altogether. Otherwise I use my Robot-Coupe (food processor), a coconut grater, a ginger grater, a mouli, a bunch of tea towels and, of course, good quality pots pans, steamers and woks. Stuff growing on trees and in the dirt, seeing stuff in the garden or pondering about what to do with stuff while it teases you, slowly ripening. At the moment my cape gooseberries are not far off, having just formed their paper lanterns. They’ll be beautiful in a nice, light, feta salad. My first wok, gifted to me by the Thai chefs when I left my first proper restaurant job, 20-something years ago. It’s a “baby” or training wok, which you use when you’re only trusted to cook one serve at a time. I unleashed my first-ever noodle dish on the general public with it – possibly the worst meal ever served by a chef but I was grinning ear to ear with pride at the time. Char kwai teow noodle. The key is making the noodles from scratch and using simple ingredients: sprouts, chives, tofu and egg. It’s also about intuitive cooking, so you need to do it many times before you get the hang of it. Recently I’ve been growing a sawtooth coriander variety. It’s hardy, has a better, more robust leaf and a punchier, less soapy flavour than its cousins. Its Latin name, Eryngium foetidum, virtually translates as “foul-smelling thistle” (David Thompson refers to it as “stinkweed”). I think it’s great. This story originally ran in The Age and Sydney Morning Herald’s Good Food Sections. Read it and see some other interesting things from Simon’s home kitchen here. Or visit Simon at his own website, www.simonbryant.com.au.